Employees are the heart of every business – at Harris we are lucky to have an employee like Carol Osgood Grant who puts her heart into everything she does! Please join us in congratulating Carol as the first recipient of the “We Are Harris” award for her significant contribution to our continued success. Carol identifies with each and every Harris Core Value, but one stands out for her on a daily basis: Accountability/Responsibility/Ownership. Harris strives to give each employee the tools to be accountable, responsible, and take ownership of their work – Carol takes those tools and uses them to accomplish her personal work goals, as well as those set forth by the overall business unit. 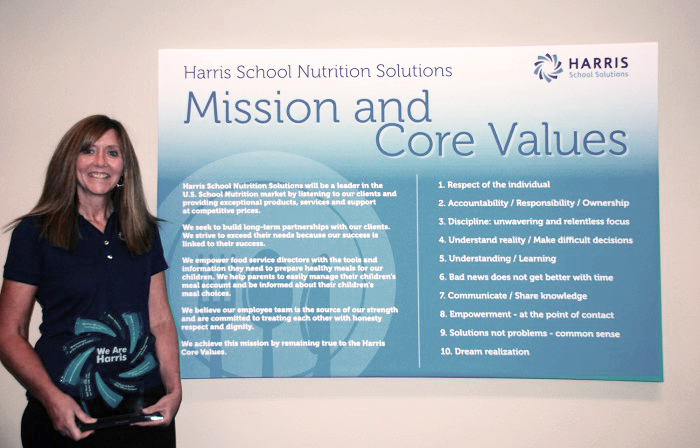 As a Quality Assurance Engineer for Harris School Nutrition Solutions (SNS) in Rocklin, California, Carol began her tenure at Harris when Schoolhouse Software was acquired in 2008. Having been involved with many aspects of nutrition software support, design and development for over 14 years, Carol’s favorite memories involve meeting new customers and working closely with them to ensure their needs are met. Carol works with the Development Team to ensure that current requests for program enhancements and bug fixes are rolled out. She also works with Support on escalations such as database or reporting issues, and assists with customer concerns and reports them to the R&D for resolution. Carol works enthusiastically with every department to improve our products and keep Harris growing. Carol takes ownership of update rollouts for the SNS products, and feels that the most important aspect of her role is to seamlessly provide Harris clients with the product updates they need and expect. When asked what Carol enjoys most about being part of the Harris team she said, “Harris is an excellent place to work. When Harris acquired Schoolhouse Software, things really took off and improved greatly. Everybody at Harris has the same goal, which is to make the customer happy. Every department in Harris focuses on that single goal and it unites us and that is why I am with Harris.” Carol loves to spend time with her family outside of work. An avid outdoorswoman, you can find Carol hiking with her husband, Ralph, working in her garden, and enjoying her role as a first-time grandmother to 17-month old Macie. Please help us congratulate Carol and thank her for her enthusiasm, passion, dedication and diligence!